Newport Aquarium is offering discounted admission to homeschool students and educators during its Homeschool Days, March 9-10. Newport Aquarium's Scales and Tails class. Tickets for Homeschool Days are only $11 per person, a savings of nearly 50 percent off compared to the standard admission price of $23 for adults and $15 for children ages 2-12. Homeschool Days allow homeschoolers grades K-12 the opportunity to enhance their knowledge of marine life and conservation at Newport Aquarium, one of the top aquariums in the country according to Travel Channel and USA Today’s 10Best.com. The WAVE Foundation, Newport Aquarium’s nonprofit partner, will offer courses through its Finstititute Classroom Experience to supplement the educational experience of exploring Newport Aquarium’s more than 90 exhibits. Serious About Sharks (9:15 a.m. each day): Students receive exclusive access to the Shark Ray Bay Theater, before the aquarium opens to the public, to learn all about sharks in a 30-minute class. Scales and Tails (10:15 a.m. each day): Students learn about reptiles while experiencing live animal encounters during this 45-minute class. Backstage Animal Experiences, where guests get an exclusive behind-the-scenes look at the aquarium, are also available to Homeschool Days participants at a discounted rate of $5, a 67-percent discount off the standard price. 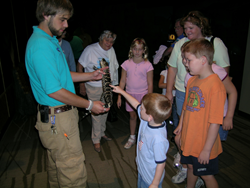 Homeschool Days tickets must be ordered through a registration form available at NewportAquarium.com. Registration for Homeschool Days must be completed by March 4. Please call 859-815-1423 for additional registration information.